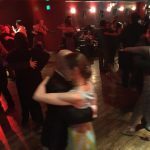 For a while, San Francisco was seriously lacking a good regular Friday night tango venue, that is until La Genesis came along. 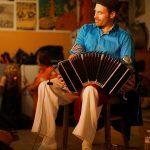 Tango Sabor (also the host of Tuesday’s ‘El V’) has been hosting this Friday night milonga for over a year now and it has quickly become one of the most popular milongas in the city. The end of the night = lot’s of room to dance. 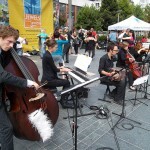 The location is Inner Richmond, a very lively neighborhood with restaurants and night life galore. If you want to grab dinner with friends before hand, this is the perfect area. You can choose from cuisine such as Burmese, to Greek to Italian or even Hawaiian. I’d say the only downside is the drive to get to this part of the city (unless you live nearby), but at 10pm in the evening, when the milonga starts, traffic is not an issue. Parking is relatively easy to find on the street, or even better take a car share. The entrance is literally right next to the popular music venue, “Neck of the Woods”, so you’ll have to squeeze past the smokers and intoxicated revelers on your way to the entrance. The Genesis Dance Sport Studio is primarily a ballroom dance studio as you will see from the photos lining the stairs as you make your way up to the second floor. 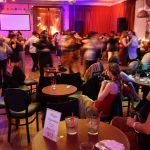 You will find yourself at the entrance of a large ballroom dance studio, with an expansive wood dance floor, couches for lounging, a snack/drink table, and tables and chairs along the perimeter of the dance floor. The ambiance is unique and special and you can definitely feel that some serious ballroom has been danced on those floors. Large widows, usually flung open, bring in cool breezes and sometimes the scent of food from nearby restaurants. The windows also help to keep the room cool, even on packed evenings. And although the studio is on the second floor, you still feel the vibrancy and energy of the area, giving a sense that you really are dancing in the middle of San Francisco. What I like about this space, and others like it, is that you don’t need to feel condemned to sit at your chosen table the whole night. With the large open space, two couches and the bar area with water, wine and snacks, it easy to get up and mingle. And with the opportunity to mingle, usually comes more opportunity to dance. On a regular night, the dance quality is usually at a high level. 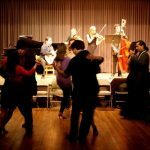 And during the recent San Francisco “Tango Shenanigans”, this milonga was at its peak, packed with high level regulars and visitors. 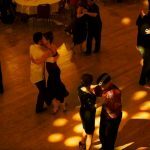 And even though the dance floor was full, there was still plenty of space for open embraces and the contained colgada, volcada or even a soltada. 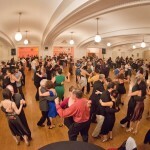 DJs vary and there is always a class with top quality guest instructors before the milonga. This Friday, June 26th is an especially exciting night. Guest instructors are the very popular, Juan Cantone & Sol Orozco from Buenos Aires. 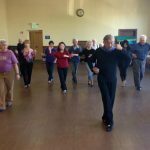 They will be teaching Circular Vals: Threading Circular Units – Exploring the idea of dancing Vals as threading a chain of beads. 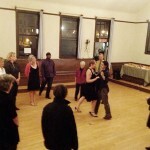 Workshop is from 9-10pm $25 includes milonga. $5 discount with college “full-time” student ID.